Children need (and want!) responsibilities. My oldest son (who is three) loves to work. Nothing in his world is more fun for him than “helping” Mommy. If I’m cleaning, he wants to be right in the middle of it. If I’m vacuuming, he wants to pick up the toys for me. If I’m making dinner, he wants to fetch the ingredients. He always wants to participate in my activities and is constantly searching for new things he can do for me. It is my opinion that children want to be needed. I believe that a child who is not required to participate in household responsibilities soon begins to feel undervalued and unappreciated. A child who cries, “You don’t care about me!” is often a child who feels unworthy of his parents affection. Self-esteem is fostered by accomplishment, and Godly esteem is fostered by accomplishment for the benefit of others. Knowing that they are valuable, necessary participants in the family unit helps children to feel good about themselves and their ability to serve others. Girls learn what it means to be help-mates and boys learn about sacrificial love. Each becomes secure of their place in the home. Giving our children responsibilities ultimately leads to fewer behavioral problems and a strong parent-child bond, which then leads to a strong relationship with their heavenly Parent. As Michael Pearl writes: “When a three-year-old boy has the sole responsibility of keeping the wood box full of firewood so the family will stay warm, he knows he is needed. He matters to Mother and Father, and to his older brothers and sisters. That they expect something of him and are satisfied by it makes the child into a man. When he has completed his job and Mother bathes him in a look of pride and appreciation, she has tied some [heart] strings. When the kids are trained to prepare the evening meal, set the table, wash the baby, arrange the house for Daddy, and then see his satisfaction and appreciation, they have tied [heart] strings. Silly boys and frivolous girls are children without meaningful responsibilities.” I think that if we want to raise helpful, happy children who will grow up to be responsible it’s important to give them an active place in our lives, with responsibilities that will communicate to them their own value and worth. Children need to be praised. It wasn’t long ago when I noticed that Bunchkin seemed to be growing tired of doing the laundry. Knowing how excited she had previously been about it, I wanted to foster her feelings of accomplishment. That day I made a special effort to thank her for her hard work, and praise her for how well she was doing. I told her I didn’t know of any seven year olds who did the laundry for their parents and I expressed to her how blessed I was by her actions. Immediately, I saw a change in her attitude and demeanor. Laundry was suddenly fun again and she made a point of showing me how well she was doing. When we value our children’s achievements (no matter how small), and express our thankfulness for the things that they do, it helps them to see that their efforts are valuable to us. No one wants to work hard all day and then feel that no one has noticed. Encouragement goes a long way in making children feel that their work is valued and appreciated, and helping them to feel proud of their accomplishments*** (1). From toddlerhood, all of our children have loved to follow me around the house, wanting to be a part of my everyday activities. They want to know what I’m doing, how I’m doing it, and whether they can do it with me. I’ve noticed that the more I include them in my day-to-day activities, the happier they are. This is especially true when children are young, and it’s my opinion that if we can win the hearts of our children when they’re young, we’ll keep them as they get older. Michael Pearl also writes: “When you become your child’s favorite fan, you make yourself indispensable to him.” One of the best ways to help our children to develop a good work ethic and enjoy working is to work with them. Right now, my daughter doesn’t want my help when she’s doing the laundry. It’s a personal victory for her to get it all washed and dried and put away by herself. But I know that soon the excitement is going to fade, and the work is going to become monotonous. That’s not the time to allow her to quit, it’s the time to teach her to rise above her feelings and honor her commitments… But that doesn’t mean she has to do it alone. My children don’t usually enjoy doing the dishes, but those same children will nearly run me over with offers to help if they see me doing the dishes. None of the kids particularly like cleaning up their bedrooms, but when I’m cleaning my bedroom I’m met with four sets of eager hands waiting for me to give them a job. When I start to sense that my children are getting “burned out” on a particular chore, that’s when I step in and start to help them. That doesn’t mean I do their chores FOR them… sometimes it just means that I work in the room with them. As the girls do the dishes, I wipe the counters and we talk. As they make the beds, I fluff the pillows and we sing a silly song together. There are lots of ways I can do chores with my children without taking away their own accomplishments. Children need to conquer new tasks. It’s true that my kids need to rise above their own desires and learn to work regardless of how they feel. I will not give Bunchkin a new responsibility until I know she is able to commit wholeheartedly and happily to those I have given her now. But all of us have a natural desire to strive and accomplish new things, and children are no exception. Eventually, it will be time for Bunchkin to move on to another task. She will soon learn how to sort the laundry (I do that for her now) and she’ll learn how to care for special fabrics (which I currently wash myself.) Once she’s proficient in the laundry room, it will be time for her to pass that knowledge down to someone else and learn a new skill. At that time, one of her younger sisters will become responsible for doing the laundry and Bunchkin will move on to something else. I could, of course, make laundry her responsibility from now on but it seems to me that it would be much wiser for me to give her the chance to pass her knowledge along, and learn some new domestic skill. This will not only keep her from becoming bored with her chores, but will also give her the chance to prove her worth (to herself) in some new area. The advice I heard from one older mom of many was to always give a chore to the YOUNGEST child capable of handling it. In this way, each child is always learning something new and being challenged in different ways as we provide them with opportunities to stretch their horizons and learn new things. I firmly believe that a good work ethic is one of the most important things we can foster in our children. It builds character and a strong relationship between family members. I know there is still a lot to be said on this subject, and many things I have yet to learn. Do you have any thoughts or suggestions on this subject? If so, I’d love to hear them! 1.) ***While the importance of praise cannot be underestimated, it is vital that we understand the difference between honest praise and false esteem. A parent who gushes over an undisciplined, unruly, lazy and spoiled child is not doing that child a favor. Deep in his heart, that child knows he is not doing anything praiseworthy and that he does not deserve our affirmations. This will not build his character, it will make him resentful – of both himself and his parents. Children want to be praised for REAL accomplishments, however small they might be. Self-worth in the Kingdom of God is not based on our achievements, but on believing what God says about us. When we praise our kids for REAL accomplishments, they are able to believe the things that we say about them, and we instill in them a sense of self-worth. Children don’t want to be coddled or lied to…. and they know the difference. So we must give our children the chance to earn our affirmations (not our love!) and give them praise where praise is truly due. This entry was posted in Cleaning/Organizing, Homemaking, Parenting, PERSONAL, Raising Children Discipline/Discipleship. Bookmark the permalink. Rina, this is a beautifully written post, and a very timely one as well. 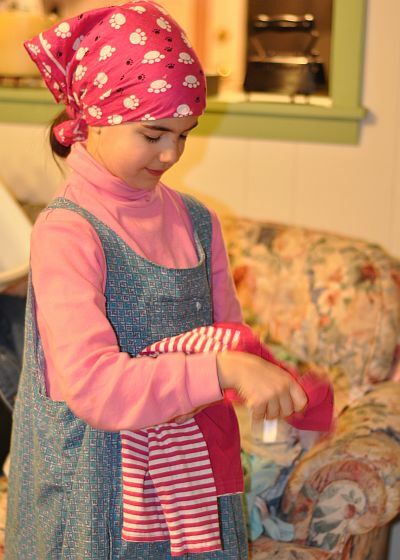 We’ve been fairly laissez-faire about having our children do chores around the house. I just hate for them to grow up too fast, and to hate me for making them do work, you know? But my kids have such a heart for helping Mommy. They so want to help, and are always asking if they can do so, and this really helps me to see that I do need to let them, or the time will come where they aren’t such willing hearts anymore. This week I decided that I need to capture this moment while I can and figure out some chores that the kids can do, and it’s not very easy going. Laundry was just the thing that I was thinking about for Abigail, and I wondered if that would be too much to ask her to do. Seeing your post today was perfect! I will start by just asking her to do her and her brother’s laundry, and start with that, it’s only one load a week, but it will be something she can take pride in. She also enjoys vacuuming and a few other simple tasks, so she’ll be easy to make a list for. My son though… any suggestions for the smaller ones? He’s five, and the only tasks I can think of would be emptying the bathroom garbages, and setting the table. Erika, I totally know how you feel when you say you’re worried that the kids won’t like you for making them work. And I do believe that children WILL resent parents who make them work if the parents aren’t working WITH them. 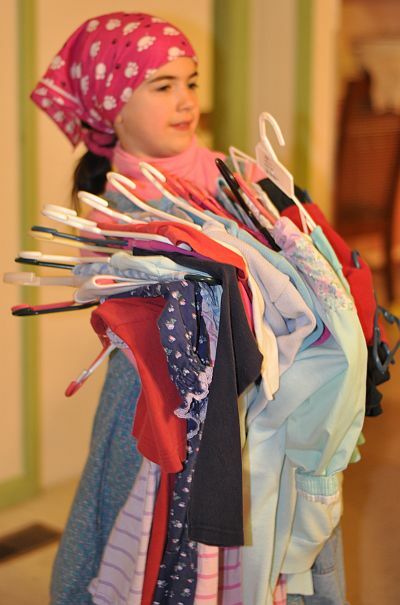 I have a friend whose mom made her and her sisters do most of the housework and rarely did any of it herself. You can bet there was some resentment there! On the flip side, I was raised without any responsibilities at all and I’m reaping the consequences of that (I struggle with laziness and a poor work ethic.) A balance certainly has to be struck, but I really believe that as long as we’re working with them, and making their work a source of esteem, they won’t be overwhelmed. Emptying the bathroom trash and setting the table are great things for a five year old to do! If you’re trying to find other things he can do, you could consider what he’s physically capable of handling. A five year old should be able to feed the animals, dust, load and unload the dishwasher, make his bed, and fold the laundry, among other things. You may not want him to do all of this, but you can determine what you think is best for him. Usually, I try to have the kids work together as a team, each child taking on the task that best suits their age level. In the kitchen, for instance, my oldest is in charge of sweeping the floor, my four year old clears the table, my five year old wipes the table, and the seven and five year old rinse and put away the dishes while the four year old is in charge of the silverware. My two year old helps by picking up any stray toys in the floor and putting leftovers in the fridge (after I put them in containers.) 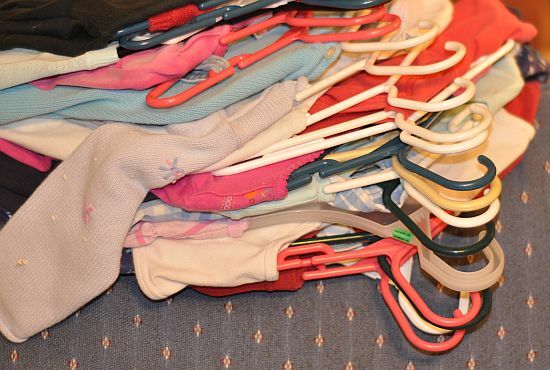 Even with the laundry, you could have your oldest girl wash and dry the clothes, and hang up the things that go in the closet, while your boy folds and puts away anything that goes in the drawers. In this way, “chores” are something that everyone participates in as a family, each doing the biggest thing they are capable of doing. This is a great, wisdom-filled post. Thanks for sharing it! We are all about having our kids help out with chores and I love to hear how other families make it work! Daina, handling the lawn at ten is a big deal! I don’t know that I would have thought to trust my kids with a lawnmower at that age… now it’s something ti keep in mind! :) Thanks for sharing. Erika, dividing the chores into smaller steps helps us because each child is a part of something big. I think working to gether helps them to bond with each other, and it certainly makes the time go by faster! I’m glad that was helpful. This post is simply great! I grew up with little to no responsibilities until I was 14 and now, although I’m pretty capable to do anything at home – except cooking (I’m a poor cook) – I still have difficulties to manage my time and not to give into laziness and self-indulgence. If and when I have children, I’ll try to teach them to be helpful at home and to show them all my appreciation for their efforts, even the tiniest. Thanks for sharing your opinions and experiences on this matter! Thanks Rina, that is helpful. I was looking at chores in their entirety- not dividing them up into the smaller steps required. Thinking in smaller steps should help me in figuring out what to have them do. As I go about my day doing a few things, I can think about the different steps I am taking, and which ones I can give the kids to do. Thanks for the advice and the encouragement! Thanks for sharing this great post! My favorite chore, growing up, was mowing the lawn — and it was partly because I didn’t know any other 10-year-old girls who were trusted to handle the lawnmower! (My dad would have to start it for me sometimes, but he made sure I could operate it safely, and I did a good job.) I felt so great to be entrusted with a chore so big. Great post. 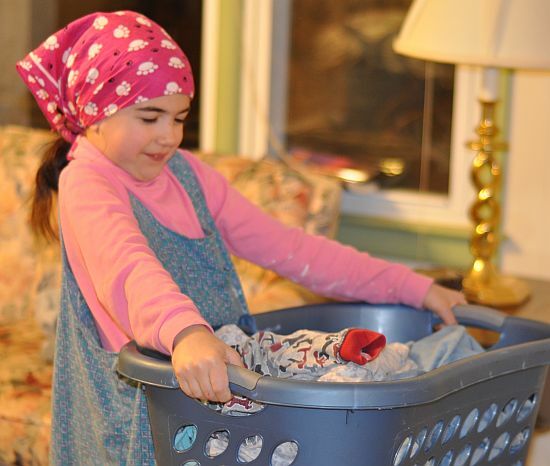 I love the pictures, she looks so sweet doing the laundry. You are so right about them needing to work. I think many moms fall into the trap these days of thinking that their kids will resent them if they have to work. If we make our parenting decisions based on fears like that we are asking for trouble. The kids are them in control and they know it. Maybe I need to give more priority to thanking them for a job well done and general encouragement. Lisa, you wrote: “If we make our parenting decisions based on fears we are asking for trouble.” That is an incredibly true and powerful statement. Thank you for sharing that. Holly, I feel that your question deserves a longer response than what I could write here so I am working on a post to answer this for you. Complaining is something that we have dealt with, too, and I have the advice of some wonderful older moms to thank for their Godly wisdom during those times which really turned things around for us. I’ll send you an email as soon as I’ve had a chance to write a reply for you. Angela, I agree… character is developed long before the teen/adult years. His Girl, thank you for your comment. I appreciate that your experience confirms these things… glad to know from a veteran Mom that I’m on the right track! I am so happy when I see parents allowing their children to take responsibility Life is very demanding and if children are never allowed responsibilty how will they learn it as an adult? This is SUCH a great post! Thank you for the reminders, especially to praise my children. So often, I get focused on all the things we have to get done and rush from one thing to the next, and I forget to encourage my children and praise their efforts. Good for you. That is the whole problem now a days. Parents are raising lazy kids which in return poor work ethics when they become adults. Kids need this. This is how they learn. We aren’t going to like everything we do but it needs to get done. I have trained my kids to ask me if there is something that I need them to do. Every little bit helps when training our children. BarbaraLee, that is an excellent idea – training the kids to ask if there is something you need them to do. I love that! I enjoyed reading this. We have four small children, and we try to practice much of this. 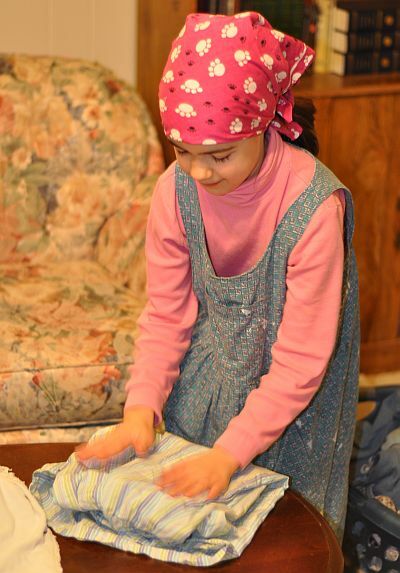 Our girls have chores, and they have been helping since they were toddlers. Our youngest daughter (just turned 2) has been clearing dishes, throwing away napkins, cleaning up toys, etc. for several months now. We make it fun, and we oftentimes all tackle a job together to make the time fly and to make it fun for all. A good work ethic is so important, and I’m glad my parents instilled that in me. Thanks! Great post! Mine on this subject is the link behind my name. Have you read The Continuum Concept by Jean Liedloff? It develops some similar ideas about children needing to feel useful and vital to the family. Becca, the article you wrote was great! I especially loved that your dad gave you a job to do when he was building the TV set. Unfortunately, I tend to get a little antsy about stuff like that and I probably would have told my kids not to touch anything. That’s a GREAT example and really encourages me to allow the kids to “help” more – even in those kinds of areas. Thank you for giving me the link. I have never read The Continuum Concept, but I’m planning to look it up! Thanks so much. As a mother of 7, all of whom have passed beyond “child”, the last two in mid teens, I understand and appreciate the points raised in this. I have always seen one of my roles as a parent being to prepare the children for independent life and modelling the behaviour they would need as well as passing on skills they need. Practical things, like planning, grocery shopping, growing vegetables and herbs from seed, cooking from scratch, laundry ( both with and without machines)… When several of the elder hit their teens there were raised voices and some arguments about why I did not “serve” them all exclusively while they sat back like lordlings and ladies ( as they claimed some of their other friends did). I listened to them. Explained why I believed my job was as a parent and explained I wasn’t that other parent but theirs and I was doing the best I believed possible.